Log in to Eventbrite and click Create Event. 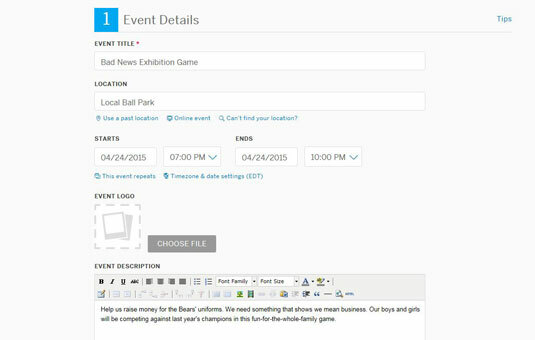 In this example, you want to raise money for your son’s Little League team uniforms by planning an exhibition game with last year’s league champions. 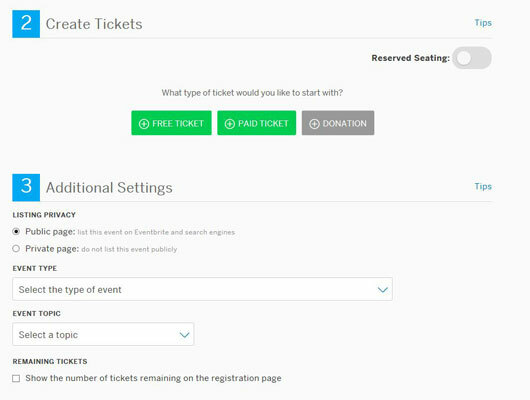 In the Create Tickets section of the Event page, select Paid Ticket. A dialog box pops up asking for further information. 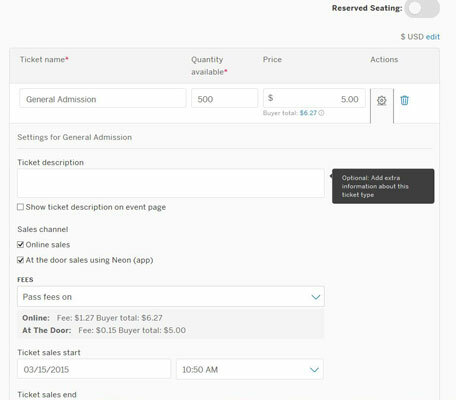 Select a ticket name, available quantity, and amount. In this case, General Admission seems reasonable, the ball park only holds 500 spectators, and you want to set an amount that’s reasonable for the family budget. Click the gear under the Actions heading to activate the Ticket Settings. Fill in whatever information you want; note that the ticket description is optional. The sales channel defaults to both Online sales and At the door sales (through the Neon app). If you aren’t prepared to sell tickets at the door, make sure you uncheck this box. The really important area here is the FEES box and drop-down options. Eventbrite offers free tickets and event-planning services for free events. However, for fundraisers or events in which the tickets are not free, they charge a service fee. Select the appropriate Fees option from the drop-down menu. Pass fees on — The buyer pays the processing fee and Eventbrite service fee. You receive the full ticket price. Absorb fees — The processing fee and Eventbrite service fee are deducted from the ticket price. You receive the remaining amount. Split fees — The buyer pays the Eventbrite service fee. The processing fee is subtracted from the ticket price, and you receive the remaining amount. 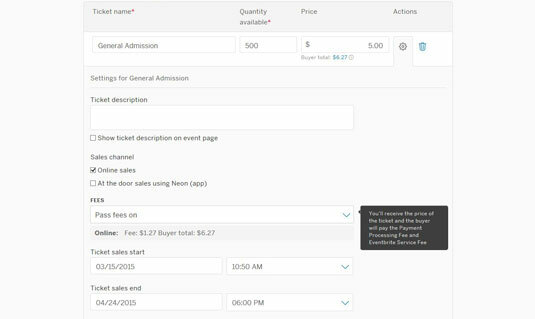 Set the minimum and maximum number of tickets sold to individuals. The minimum is automatically set at 1, but you can change that. (Although no reason to do so for a ballgame.) The maximum is left blank. You can restrict that number if you need to, allowing each person to buy up to a specific number. Click Minimize settings and then click Make Your Event Live. Your Event Dashboard appears, letting you know you just have one more thing to do. The Payment Options page appears. 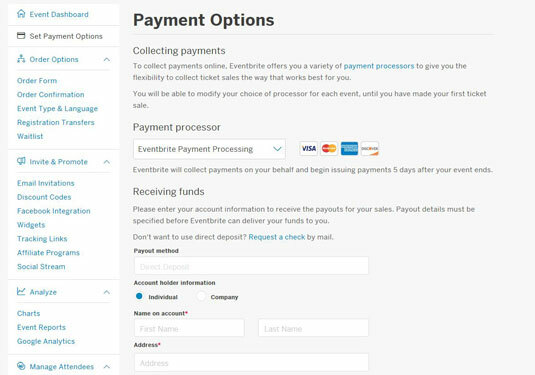 You have the choice between Eventbrite payment processing or PayPal. You also can choose direct deposit by supplying your name and account information. If neither one appeals to you, you can request a check from Eventbrite. 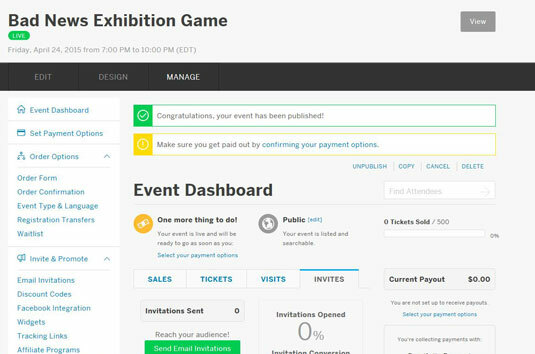 Click Save, and your event is live, and your ticket sales are up and running!